Let the half marathon season begin! 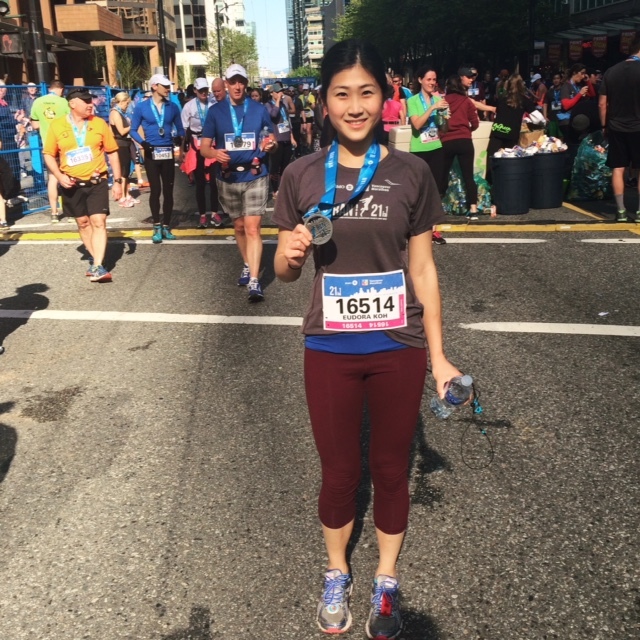 Yesterday I ran my first half marathon of 2015, The BMO Vancouver Marathon (the first half of 2015 in Vancouver, BC was the ‘First Half’ back in February). 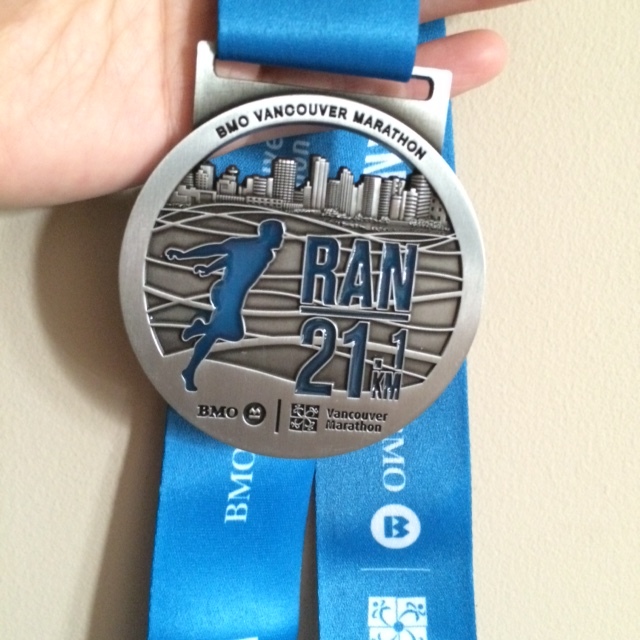 For those who ran last year’s BMO half marathon, you remember that it was raining…during the entire race. So it was such a treat to be able to run in yesterday’s weather, which I thought was perfect – not too cold yet not too hot. 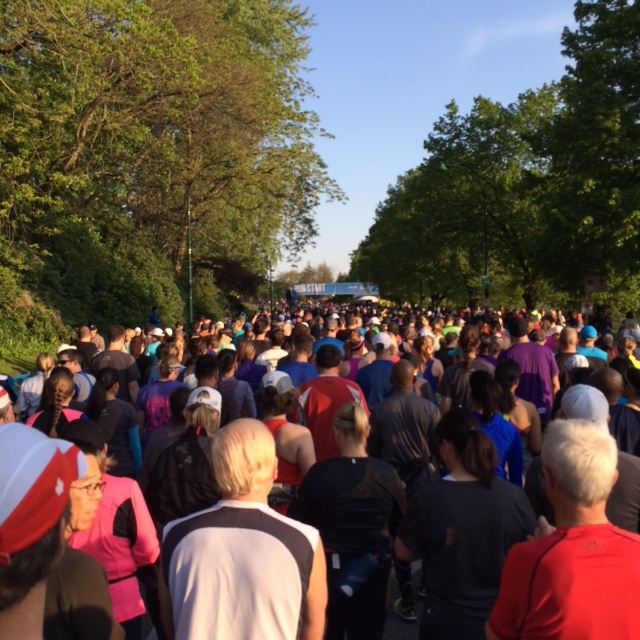 Queen Elizabeth Park – Anxious runners waiting to start the race! The scenic route of the BMO half never disappoints – we start at Queen Elizabeth Park, run through Chinatown, along the oceanfront, end up on Stanley Park’s Seawall and then finish in downtown at West Cordova and Thurlow. 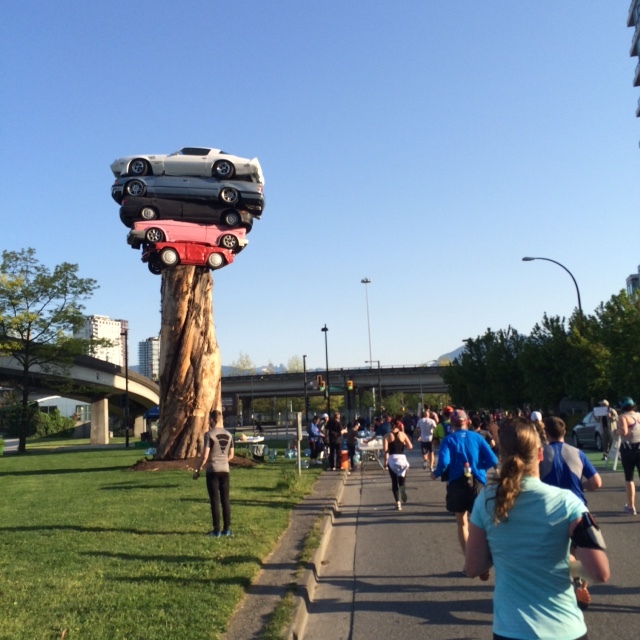 A neat art installment on Pacific Boulevard along our race route. The first 15-16km felt great, but towards the last stretch, my right side and knee were hurting, so it was a real mental game from there until the finish line. A lot of what it takes to complete any race is thinking that you can do it, because if your mind is strong and determined and tells your body to do something, your body surprisingly will do it. Take it from me. I managed to pull off a personal best time of 2 hours, 6 minutes and 15 seconds! A happy camper after crossing the BMO half marathon finish line! The pain I’m experiencing now was totally worth every minute of it! I love BMO’s finisher medals – they look so legit! Moments after crossing the finish line, receiving my finishers medal and some photos, I was happy to see familiar faces of some friends who are also awesome runners! Ran into some friends, who happen to also be awesome runners. They both ran the half in under 2 hours! Despite a possible sprained knee and an entirely sore body, I am so happy I ran the BMO half marathon and even happier that it’s now over! As for any race, it’s such a feeling of achievement, triumph and fulfillment when you cross that finish line. 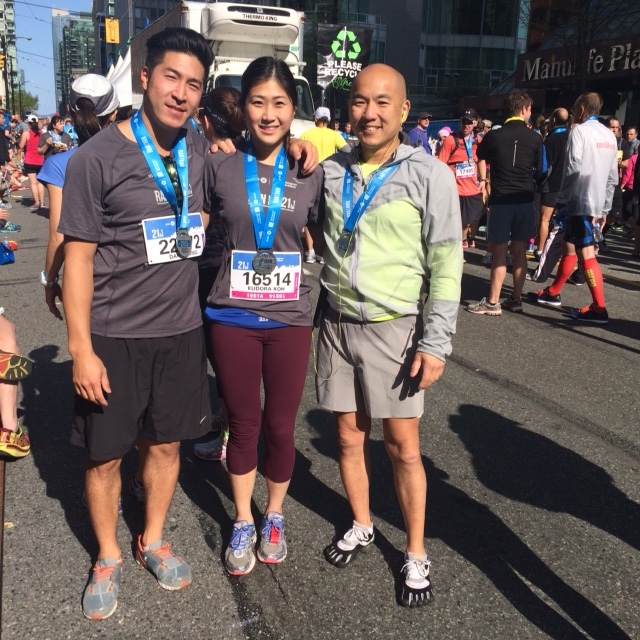 Congratulations to all the runners who participated in any of yesterday’s BMO Vancouver Marathon races! 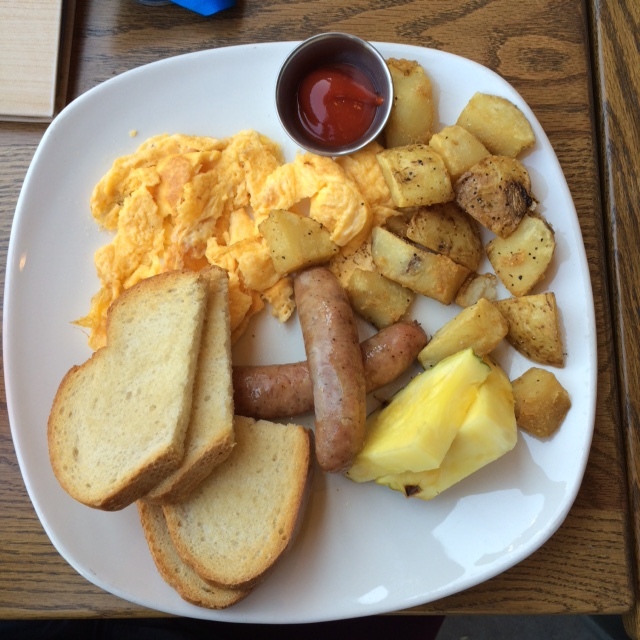 Hope you all indulged in a well deserved post-run brunch/meal. Make sure to rest your legs for the next week or so, to properly recover and be in your best shape for whatever’s coming up next for you! So cool! 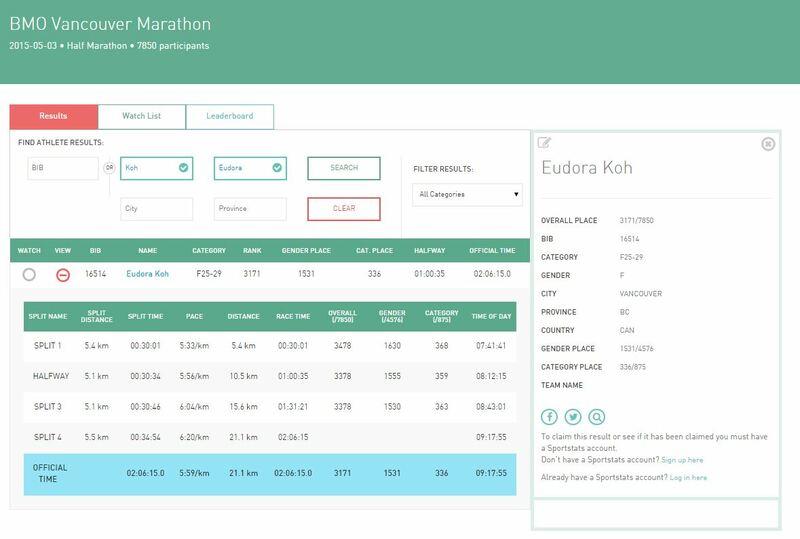 A breakdown of yesterday’s half marathon at four points of the race. Definitely sloooowed down at the last portion…! My upcoming half marathons: The Scotia Bank half marathon at the end of June, and then the ever so popular Lululemon Seawheeze in August, and maybe the Rock n Roll in October!